UDM Downloads > Splendid City Lite, Sports Scheduler (Mac OS X)! Splendid City Team Sports Scheduler, and Sports Scheduling Software System is useful for people who organize team sports or game events. Use it to manage and publish sports schedules of any size and complexity. Automatically create high quality double or single elimination tournament brackets, round-robin league schedules, swiss round tournaments, cross divisional or practice schedules for any sport that requires pairings. 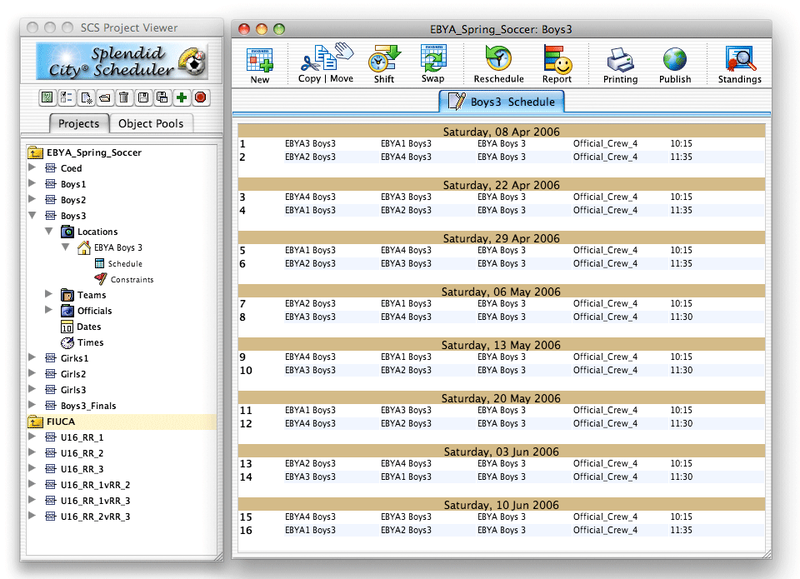 It features options that include the ability to set team and field constraints, game lengths; configurative time management utilities to help you organize events the way you would like; object constraint sharing; automatic schedule generation and re-generation; configurative project web site creation, tournament brackets; publishing via FTP, export to HTML, CSV, iCalendar, XML; import from CSV; standings support with tie-breaker formulas; contact management; import teams, fields, officials, players and player rosters from other users' projects ; constraint and conflict checking and resolution. Users can freely exchange all data associated with projects with other users who have a free copy of Splendid City Lite installed regardless of platform. The application comes with an integrated e-mail client that can aid with the exchange of object files among organization members. There is also a simple FTP client for direct uploading to web domains from within the schedule view frame. The scheduler gives you complete control over all aspects of the schedule, and creates solutions effortlessly and elegantly in accordance with the user data entered. It can be custom-tailored, and with repeated use via a plugin interface, can be made to automatically accomplish users' unique scheduling needs. The user experience is interactive and straight forward. The application comes fully documented with a built in searchable help system to provide answers to implementation questions. Several tutorials are also provided.